For the opening exhibit of the 2018-19 academic year, East Stroudsburg University’s Madelon Powers Gallery will feature the works of two regional artists who use crafting techniques to create unique mixed media pieces. ART/Craft/ART, featuring ceramics by Ellen Silberlicht and jewelry by Brienne Rosner, will be featured September 4-28. A reception for the artists will be held Wednesday, September 5 from 4-6 p.m. in the gallery. Both the exhibit and reception are open to the public at no cost. Hours for the gallery, located in the ESU’s Fine & Performing Arts Center, Normal and Marguerite streets, are 11 a.m.-7 p.m. Wednesdays and Thursdays, and 11 a.m.-4 p.m. Mondays, Tuesdays and Fridays. “My work reflects my life’s journey in and out of the studio,” Silberlicht said. After earning a B.F.A. from the School for American Crafts at the Rochester Institute of Technology, she spent 25 years traveling around the world before returning to Honesdale, Pa., her hometown; earning an M.A. from Marywood University; and teaching art, concentrating mainly in pottery. Silberlicht thinks of herself as a sculptor who works mostly in clay but uses other media to fulfill her artistic vision. 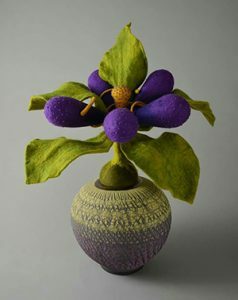 Her recent works have married her two favorite materials, clay and felt. “I love the forms and textures and the contrast of materials, Silberlicht said. “The color is a joy to work with, because when you work with clay, you don’t get to see the actual color until the end of the process.” She also noted that joy and humor are consistently manifested in her pieces. Rosner, a jewelry artist and Stroudsburg resident explores space, movement, and surface by layering materials in intricate patterns. “My mixed media pieces are a marriage of image and object, adorning the wall and the body,” she said. In addition to maintaining her own studio, Rosner is gallery director at Peters Valley School of Crafts in the Delaware Water Gap National Recreation area. She earned a B.F.A. in painting with a minor in art history from Boston University. For more information on the exhibit or reception, contact the Fine and Performing Arts Center at esuarts@esu.edu or call 570-422-3483.